Yes, it's an oval cabochon... No, I don't like ovals myself... 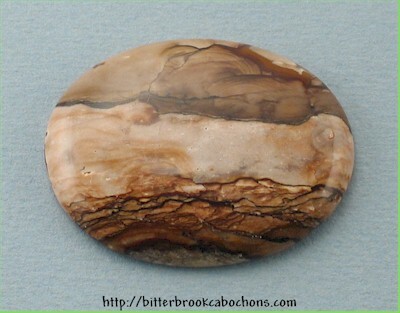 But this Biggs Canyon Jasper just needed a lot of area to include the "picture" I found in it. Imagine rapids crashing through a high walled canyon with gathering storm clouds in the distance, and there it is. A big cabochon for a big picture. 40mm x 30mm x 6mm. Weight: 55.35 carats. You are visitor number 35 to this page this year.